Record Clarets signing Chris Wood is looking to earn a better reputation than the arsenal of strikers that have preceded him at Turf Moor. The 25-year-old, who is confident that it will be third time lucky in the Premier League following his big money move from Leeds United, believes that he can emulate the success of Jay Rodriguez, Danny Ings, Charlie Austin and Andre Gray in the top flight and is even backing himself to push on to another level. Last season's Championship top scorer, who has featured for West Brom and Leicester City in England's elite division, feels that his dramatic debut goal against Spurs at Wembley is just scratching the surface of what is to come. “Its a nice start but that is all it is a start," he said. "There is a long way to go in the season and a long way to go in my Burnley career so I am looking forward to it. “I feel like I am in the form that I knew I had in me all along it has just taken a full season under my belt to get that. I feel like I can keep progressing and do even better. “It has always been my goal to play in the Premier League and when Burnley came in, I found out after the first bid was rejected how keen they were and things moved very quickly after that. "I was keen to get here and start my Premier League career off again and hopefully kick on in the right direction. “We have got five great ones (strikers) here as well. Its brilliant they have been very fortunate with strikers over the years and hopefully it will continue. "There has been some great pedigree that has gone on to do well in the league and across the country, hopefully I will be able to do the same as them or maybe even eclipse them." 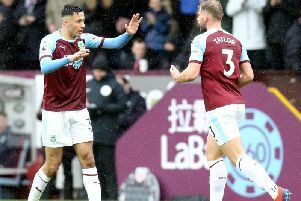 The New Zealand international wasted little time to make his mark when firing past Hugo Lloris to preserve Burnley's unbeaten away record this term. The Auckland-born forward then scored a stunning hat-trick in his nation's 6-1 thumping of the Soloman Islands to push the All Whites towards a play-off against the fifth ranked South American side. Still, Wood isn't taking anything for granted having reported back for domestic duties and knows that he faces a fight to edge his way in to boss Sean Dyche's starting XI. “I’d like to think [he's earned the chance]. It is going to come down to my performances during the season whether I stay in the team or fight to get into them. "It is not going to be an easy road, I am not guaranteed anything, it is going to come down to hard work and making sure I am playing well for the team. “I think I am capable of scoring most (kinds of goals). I won’t go scoring a worldy every week but I work hard and most of my play is inside the box and making sure I am in the right positions and ready for the opportunities. Hopefully, if the opportunities are there, I will put them in the back of the net. "I believe in myself that I have more than (being) a target man or typical number nine, as they say. I think I have more to my game than that. I can play that no problem but I think I have more to my game definitely."